2019 Best Film, Video & Photographic Arts Colleges in the U.S.
Not quite as common as some other college majors, you can still find a significant group of young people interested in studying Film, Video & Photographic Arts. 11,392 graduates earn a Film degree every year, earning it a placement of 47th most popular. Film, Video & Photographic Arts ranks 84 out of 121 college majors for graduate salaries. This causes it to be around the lower end for earning potential, even so you could raise your odds of a high-paying career by deciding on an excellent degree program and pursuing further education. 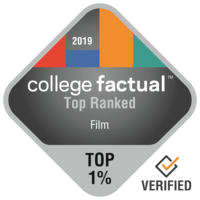 The following list ranks the best colleges and universities in the U.S. for a Film, Video & Photographic Arts degree. Our ranking methodology takes into account factors such as education quality, average earnings of graduates, accreditation, and several other relevant factors. Looking for the best of the best? Check out University of Southern California to pursue your degree in Film, Video & Photographic Arts. In addition to its bachelor's programs, University of Southern California offers graduate degrees in Film. University of Southern California is one of the largest schools in California. Over 59.0% of undergraduates receive some type of financial aid at University of Southern California. You may want to invest in an ACT prep course before you take the test because the usual ACT score is 32. Interested in learning more about University of Southern California's campus? Go on a virtual tour. Every student who is interested in Film, Video & Photographic Arts has to check out New York University. New York University offers graduate degrees in film for those interested in an advanced degree. The location in a major city is great for scholars trying to find adequate opportunities for social networking, adventure, and exploration. University of California - Los Angeles is among your best bets if you're planning on studying Film, Video & Photographic Arts. Graduates of the film program make an average of $43,478 in their early career salary and $84,377 in their mid-career salary. The setting in an important urban center is great for young people seeking out considerable opportunities for social networking, adventure, and exploration. Around 58.0% of applicants submit ACT scores, with the standard score being in the 30 range. For graduates who want to carry on after earning a bachelor's degree, University of California - Los Angeles has grad programs available. Ever wish schools were graded with a report card? Now they are. Visit University of California - Los Angeles' scorecard. It's hard to beat Art Center College of Design if you want to pursue Film, Video & Photographic Arts as a major. In addition to its bachelor's programs, Art Center College of Design offers graduate degrees in Film. Pasadena, California is an appropriate setting for college students who appreciate the fast-paced city life. Taking into consideration that 61.0% of students at this school obtain educational funding, don't forget to complete the FAFSA. For graduates who would like to carry on following their bachelor's degree, this school has grad programs available. Where is Art Center College of Design really succeeding? Check out all of the school rankings. Any student pursuing a degree in Film, Video & Photographic Arts has to check out Loyola Marymount University. Graduates of the film program make an average of $44,772 for their early career and $64,925 in their mid career. Placed in Los Angeles, California, this school is a very good choice for students who enjoy the buzz of a large city. With 53.9% of the instructors working full time, students are sure to get plenty of interaction with instructors. This school does not require freshmen to live on-campus. A virtual tour could be a great way to explore Loyola Marymount University. It's hard to find a better school than Rhode Island School of Design if you wish to study Film, Video & Photographic Arts. In addition to its bachelor's programs, Rhode Island School of Design offers graduate degrees in Film. Positioned in Providence, Rhode Island, this school is best suited for learners who blossom in a city atmosphere. Graduates of Rhode Island School of Design usually don't have issues repaying their student loans; just 1.3% defaulted. Rhode Island School of Design has a great graduation rate, with 68.1% of students graduating on time. Videos from Rhode Island School of Design could be a great way to learn more about school. Emerson College is a great option for individuals interested in a Film, Video & Photographic Arts major. Students who complete this degree state that they receive average early career income of $40,193 and mid-career income of $59,790. Boston, Massachusetts is an appropriate surrounding for young people who appreciate the fast moving city life. The average scholarship amount granted to first years is $19,176 with 61.0% of first years obtaining an award. There is a grad program accessible for students who are curious. The scorecard will give you a fantastic summary of Emerson College. It's hard to beat University of California - Berkeley if you want to study Film, Video & Photographic Arts. Students who graduate from the film program earn an average of $45,184 in their early career salary and $77,309 in their mid-career salary. University of California - Berkeley has one of the largest student bodies in California. 97.0% of freshmen return for their second year. University of California - Berkeley graduates seem to be doing well in the world as they are way less likely to default on their student loans compared to grads from other schools. Learn more to see how well UC Berkeley ranks in other categories. Yale University is a good decision for individuals interested in a Film, Video & Photographic Arts major. Yale University film, video & photographic arts graduates receive 33.9% more than the typical film grad. The setting in a large urban center is great for students seeking out considerable options for social networking, excitement, and exploration. Yale's 6:1 student-to-faculty ratio is among the very best in the United States. Students from outside the U.S. need not be worried about being out of place mainly because 10.7% of Yale's undergraduates originate from countries outside the U.S.. Where is Yale University doing the best? Look into all the school's rankings. University of California - Santa Barbara is a great option for students pursuing a Film, Video & Photographic Arts degree. Students who graduate from this program report average early career earnings of $35,820 and mid-career earnings of $79,565. With more than 20,000 undergraduates, University of California - Santa Barbara is one of the largest schools in the nation. You will get a high-return on your education investment with University of California - Santa Barbara, due to the fact its net price of $25,177 is an excellent value. Due to the fact the usual SAT score of this school's applicants is around 1,255, admissions officers can afford to be selective. Interested in learning a little more about University of California - Santa Barbara's campus? Take a virtual tour.